Chewing gum is such a curious invention. 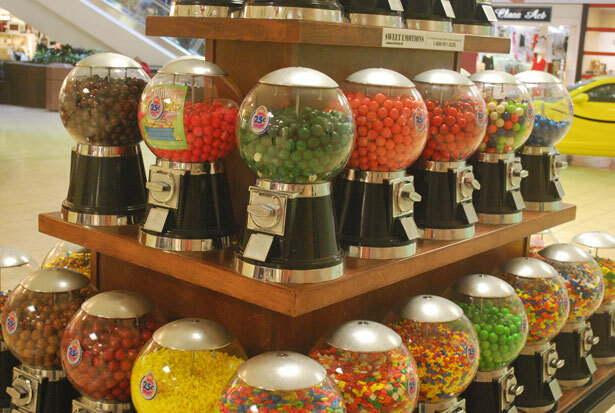 Imagine you are a child, and you come upon the gum ball machines in the picture. Confronted with such a variety of colorful, delicious, sugary treats. You may already have a favorite in mind, or it may take your mother saying, you have one more minute to choose. So you offer your coin for a gum ball. You look it over, amazed by the dispenser, and pop it into your mouth. You crack the hard surface of the shell, and the flavor of it spills into your mouth. You chew vigorously until it becomes a soft, pliable wad, and then you savor it until every last bit of the flavor is gone. We can’t see it, the flavor, but it is there. There are all sorts of gum varieties on the market today. Each one promises its flavor will last. Some are sugar full, and bad on the teeth. It sticks to your dental work and so it is not good for you. Some of them are sugar-free and easy to chew. However, all of them will lose their flavor. You will have to get more to enjoy the sweetness again. God’s word is offered to us in the bible as a variety of flavors and textures to chew on. Yet, not only are the words separated by chapter and verse, but by covenant. In the Old Testament what we are offered is hard to chew with little flavor. In the New Testament the work has been done to crack the hard surface making all the flavor easy to enjoy which lasts longer. While gum may be calorie free, the Word of God is not. It is not something we use to suppress our appetite, but to fulfill it. It is life a health to us. Meditation on the Word of God is like chewing gum. You select it, you place it into your mouth, you chew on it, and keep chewing until all the flavor is gone. Don’t stop chewing until it melts into your soul and gives you life in your Spirit. Good gum leaves you wanting more. Good gum makes you want to share. Our audience of One knows that if we intend to live and love for His glory, making Him our audience in all we think, say, and do, that our hearts must be full of His word. This chewing it gets our digestive juices flowing to prepare our body for absorption and nutritional distribution.Then just like we might offer someone a stick of gum when we have it, we can offer the Word we have stored up in our hearts. So how do we chew on the Word? First, we choose it, then we crack the shell with the work of the Savior, then we savor the sweetness, and its flavor until the flavor has been absorbed into us. 26 that He might sanctify and cleanse her with the washing of water by the word, 27 that He might present her to Himself a glorious church, not having spot or wrinkle or any such thing, but that she should be holy and without blemish. What flavor, Beloved! Our audience of One, presents us to Himself free of blemish through what He has done for us. Chew on it, digest the flavor into your soul, it will give you life and health. Then share it today knowing your faith in what Christ has done for you is pleasing to God. Strong’s concordance was used for the interpretation of the Word.